Seafair Pirates Landing July 7 and upcoming Seafair events. Local swashbuckling legends the Seafair Pirates arrive at Alki Beach Saturday, July 7, to kick off the 69th annual Seafair summer festival. Pirate fans and costumed wannabes will swarm the beach to see the pirates “sail in from the seven seas” ahead of a day filled with music, vendors and a knighting of the Pirates’ newly appointed Captain Kidd, among other festivities. 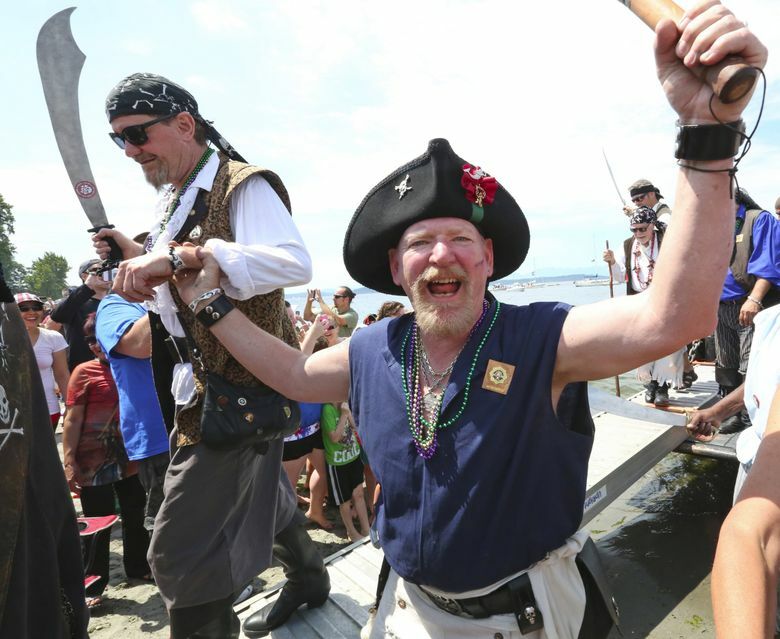 In typical pirate fashion — and subject to the tides — the Seafair Pirates can’t be tied down to a specific landing time, but they’re expected sometime between 1:30 and 2 p.m.
A local tradition since 1949, the Pirates’ arrival draws thousands of fans. Parking in the area is extremely limited, so if you can, go by bike, bus or water taxi. If you must drive, allow plenty of time to find a place to park. Another longtime favorite Seafair event, the Milk Carton Derby, will take place at Green Lake on Saturday, July 14, with milk-carton boat racing for prizes, and activities on land including entertainment, exhibits and food vendors. Updates this year include a new beer garden and a new racecourse that will make it easier to watch from Green Lake’s Aqua Theater. Tickets are available on Seafair’s website for its two signature events, the Torchlight Parade on July 28 and Seafair Weekend Aug. 3-5. Most parade attendees gather along the sidewalks for the Torchlight Parade, but bleacher seating is available ($35-$60). There is also a variety of ticketing options for Seafair Weekend Festival (with hydroplane racing and an air show featuring the Blue Angels), from general admission to special seating options ($10-$150). Registration is also available for the July 28 Torchlight Run 5K and 8K, which takes off through downtown Seattle, and over the Viaduct for the last time before it’s torn down. Last year’s run sold out, so plan ahead accordingly if you want to run this year. Seafair also sanctions dozens of summer events around the region, with information available on its website and on its app, available on Google Play or in the App Store. Time: 9:30 a.m. to 5 p.m. July 14, events begin at 10:30 a.m.